First published here for The Platform. The last few months have seen a rapid increase in anti-Muslim sentiment amongst sections of the political class in Sri Lankan society. The situation has yet to deteriorate to the extent that the default image of a Sri Lankan Muslim is one represented by an anti-Sri Lankan or anti-Buddhist element. But the trend that is developing is truly alarming and surely points towards such an inaccurate mental image. 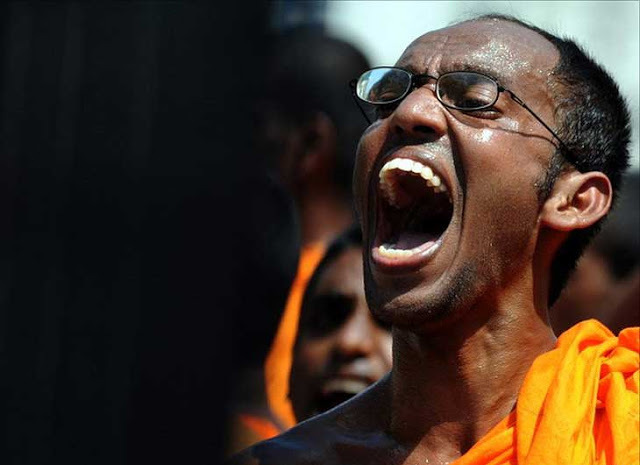 The rise of extremist Buddhists in Sri Lanka is truly disturbing and does not bode well to the sense of national resilience that the government is trying to foster, at least in its rhetoric. There is to be a protest march in Colombo today that is supposedly against ‘Islamic Extremism’. The leaflet however, unable to find tangible examples of Islamic extremism in Sri Lanka, instead highlights international examples. The leaflet was first tweeted by Groundviews and was then picked up by other bloggers. The language used in the leaflet is particularly confrontational and is written in jargon generously peppered with phrases such as ‘enough of being silent’ as a precursor to the more confrontational language that follows. The leaflet speaks of numerous instances where it alleges that Islamic extremism has acted malevolently towards Buddhists and Buddhist holy sites in many parts of world, including in Burma, Thailand, Afghanistan and even the eastern parts of Sri Lanka. It is clearly designed to fuel the ignorance of the apolitical (mostly innocent) Buddhists against the Muslims and is therefore composed of materials that are innate historical inaccuracies at best and factually vacuous at worst. It specifically refers to the recent incidents in the south of Bangladesh where there have been attacks on Buddhists by groups of Muslims. Of course nowhere is the ethnic cleansing of Rohingya Muslims by Buddhist extremists in adjacent Burma mentioned. The last paragraph of this leaflet quite explicitly states something on the lines of: it is time to show that this (Sri Lanka) is a Buddhist country by word and deed; many have forgotten that this is a Buddhist country, this notion should be reawakened. Extremists should be struck down as they flee. When cruel Islamic extremists prey on other innocent Buddhists, and when the entire world remains silent in the wake of it, it is time that we reawaken our race (Sinhala Buddhists) to respond to this. The implications of the call to “reawaken” invoked in this context is particularly disturbing. Sri Lankan Muslims have absolutely nothing to do with the alleged crimes against Buddhists or Buddhist interests in Bangladesh. Similarly Sri Lankan Sinhalese and Buddhists have absolutely nothing to do with the heinous crimes committed against the Muslims of Burma. What these Buddhist extremists seek to achieve for the alleged benefit of their Buddhist compatriots abroad remains to be seen. For Buddhists who feel that they are persecuted in other parts of the world, this exercise by minute sections of the Sri Lankan Buddhist community will be futile. Surely the Buddhist leadership in Sri Lanka is intelligent enough to grasp this fact. What exactly then does this exercise seek to achieve? The result of these sorts of protests (yes, plural, this is to be one of a series of protests) are multiple. Sinhala – Muslim relations have always been cordial and strong. The current generation of Sri Lankans cannot easily be buoyed into buying an argument that Sri Lankan Muslims are a bane on the nation’s social fabric. Buddhism as a faith has thus far survived the vulture-esque assault by sections of a largely secular media that paints most religious faiths as violent, something that protests such as these threaten to undo. Moreover, Sri Lanka is rebuilding itself as a nation after decades of conflict that not only curtailed and stunted growth but also damaged it. Creating an environment that will marginalise Muslims can sow the seeds of future conflict. Yesterday, the All Ceylon Jamiyathul Ulema (ACJU), the main decision-making theological body for Sri Lankan Muslims, released a media communiqué condemning the attacks on Bangladeshi Buddhists. The wisdom of releasing this communiqué is certainly questionable. Whether the ACJU has released statements for similar causes previously is anybody’s guess. There is no doubt that the body acted in the best interests of Sri Lankan Muslims and of Sri Lanka as a whole, yet the timing or indeed decision to make such an overture seems hasty. The despicable acts on Bangladeshi Buddhists have absolutely nothing to do with Sri Lankan Muslims. However, such a press release can create the impression amongst wider Sri Lankans of a sense of guilt amongst Sri Lankan Muslims when there is none due to there being no grounds for guilt. Additionally, the release of such a statement can institutionalise the necessity to release communiqués almost every time a Buddhist place of worship is attacked anywhere in the World, thereby creating an undue burden of responsibility. Now, replace the word ‘countries’ with ‘communities’ in the paragraph above and see how it reads. The roots of extremism rest in vested interests of various interest groups as much as it does on the absence of law and order and the socio-economic state of the parties in conflict. The Sri Lankan economy at the grassroots is in turmoil and the Sinhalese community, as the larger ethnic group, is the most affected. An economically weak nation with near bankrupt sections of the public can foster groups that are represented by intellectually bankrupt individuals who posture as leaders at a local or national level and exploit patriotism for their ends. As Samuel Johnson wrote, “Patriotism is the last refuge of the scoundrel”. One only need observe a group of scoundrels against a group of self-confessed patriots to realise that there is too often much in common. The 1915 riots are commonly known as the ‘Sinhala – Muslim’ riots, not by the name of individuals. The way in which the Sri Lankan Muslims react now will determine how history will testify for or against them. In the future, no matter what the political situation in Sri Lanka, the Muslim community will continue to exist in every strata of society. Muslims in Sri Lanka are living in politically perilous times; they reside amongst a largely accommodative Sinhalese and Tamil population, apart from the odd elements that opportunistically seeks to whip up racial tensions. In the short term the Muslims should act prudently and actively within the framework of Sri Lankan law. They would do well to deal indifferently towards bankrupt extremism and not dignify it by seeking to confront it, except with a pragmatism that respects legal and constitutional norms. In the long term they should be conscious that Sri Lankan Muslims are more tangible as a constituent element of Sri Lankan nationhood than a transient Buddhist extremism. The latter not only misrepresents Sri Lankan Buddhists at large but is against a unified vision of Sri Lankan nationhood. It is ironic that even the best of intentions, when circumstances change, they can have unintended consequences. The man who invented the wheel, for instance, would never have expected Top Gear, where viewers are bombarded with a bit too much of Jeremy Clarkson. Likewise, social media has transcended its initial intentions. Whether one agrees or disagrees, one would be inclined to consider this to be remarkably genuine. The extra judicial killing of Ahmad Jabari, the head of the Al Qassam Brigades, led to the recent escalation of violence in the Gaza strip, with Israel using disproportionate force in ‘retaliation’ to Hamas rocket attacks. Israeli attacks resulted in over 100 Palestinian deaths and less than ten Israeli deaths. Palestinian casualties would have been much higher, if Israel had initiated a full scale ground invasion as in 2008, and if not for the truce between Hamas and Israel. Israel has said that it will never negotiate with “terrorists”, although Hamas very much fits the Israeli description. Misfortune gives rise to the excitement of three very similar but different sets of groups: The Activists, Armchair Activists, and The Cynical Sedentary Scoffer’s. Activists are staunchly dedicated to a cause. Much like career politicians, but perhaps not as allured by fame, fortune or material possessions, they are driven by an unblemished ideological underpinning. In this particular conflict, activists were usually pro-Palestinian, pro-Israeli/Zionist, or human rights activists. Pro-Palestinian activists largely comprise of Muslims, Lefties, Liberalsand/or Humanists. Solid activists live for a cause and find great satisfaction in the work they do and are, therefore, willing to sacrifice much of their personal comforts to get that one extra inch closer to their goal. Then we have activists of the armchair variety – a tricky lot, and much like a Dulux colour palette, come in various hues and varying saturation. I trust an armchair activist is a person commonly understood to propel a cause sitting on an armchair (or toilet seat). Due to advances in social media, the vagaries of an armchair activist has become somewhat limited to being active online and disseminating information. Armchair activists usually take a lot of stick from various people for being “neither here nor there”. The reality, however, is very different – at least for most of them. To be an armchair activist, one usually needs to have a sense of ideological bearing, diluted as it may sometimes be compared to activists out in the field. The content of their Twitter feeds or Facebook status may be determined by their personal interests, type of friends, followers, want for attention and recognition, and all of the above, or even none of the above. If one is an activist, at some point in their lives they may have been an armchair activist or may even have had armchair stints. This may be at a time when being in the forefront of activism isn’t particularly feasible, like when one is a student and therefore can’t fully engage in activism due to time constraints. Therefore to consider the term ‘armchair activist’ to be heavily concentrated with negativism is preposterous, if not plain wrong. The role of an armchair activist shouldn’t be underestimated – they provide a vital service by disseminating information that they rightly or wrongly think would aid their cause. Of course it is up to the receiver to verify information before they act upon it. As a full-time student inundated with assignments and exams, the most effective form of activism I can be involved in, is armchair activism, with my blackberry to hand. Of course, a common mistake armchair activists make is to be too idealistic or rhetorical in their actions. This occurs when the gulf between theory and ground realities diverge and expand. Therefore armchair activists should be conscious of this inevitability and be measured in their tones. I believe (or like to think) that by making my voice heard, I do make a difference and help to formulate opinion that would be useful. This might enable the average apolitical or political person to understand the world better and galvanise like-minded souls to work towards a noble cause. Like activists, armchair activists come under intense pressure from various elements in society. From those who hold opposing views to those who have found too much immoral comfort in the status quo to want to change it, to the plain idiot who would much rather question the means of activism than come up with something original. Therefore defeatism is intrinsic to the psyche of some activists or armchair activists, and they fight such sentiments not to their peril. The feeling that one’s tweets with the hashtag #Gaza would result in nothing is an understandable feeling. If armchair activism ceases, activists on the field will have to shoulder the added burden of disseminating information, thereby delaying progress in the cause, in this case exposing Israeli war crimes and fighting the powerful Zionist propaganda machinery. If you have activist-y (for lack of another word) intentions, and yet, can’t really engage for one reason or another on the “frontline”, take heart in the fact that your services as an armchair activist are much needed. Purify your intentions and find the nearest armchair (or toilet seat), wherever your thoughts flow unhindered. Remember, however, that with your intentions and actions comes the responsibility to act within a discourse of morality and nobility that does not cause more problems. This conveniently brings me to the third and final group, The Sedentary Cynical Scoffer. These are those who would much rather scoff at those who try, and pointedly do nothing productive themselves. This mostly being because they seem to think that activists or armchair activists act on matters that have no bearing on their own lives, or of others. One may not be a US citizen, but it does matter if Romney or Obama won the last US presidential election – though for most people Obama and Romney are as close to each other as bum cheeks, politically speaking. Given the position of the US in the world and the globalisation they perpetuate as a super power, it is a given and isn’t even worth mentioning that the president of the US is going to have a bearing in life wherever in the world you live. So, the next time you see a Facebook status or tweet that is political and different from your tweet that possibly says “I just burped aloud, but no one heard #facepalm #aerobicdigestion”, please note that some others are driven, motivated and affected by what happens in their homes, in their own backyards or the backyard of a friend who lives next to a bully that is supported by the biggest bully in the neighbourhood, and a few other smaller bullies. People are driven by various facets of life, and as long as these facets do not impose tangible and direct harm, scoffing at another’s efforts only seeks to undermine your own standing.